A change to its end-of-race overtime procedures at its two biggest speedways—Daytona International Speedway and Talladega Superspeedway— has been announced by the ARCA Racing Series presented by Menards. 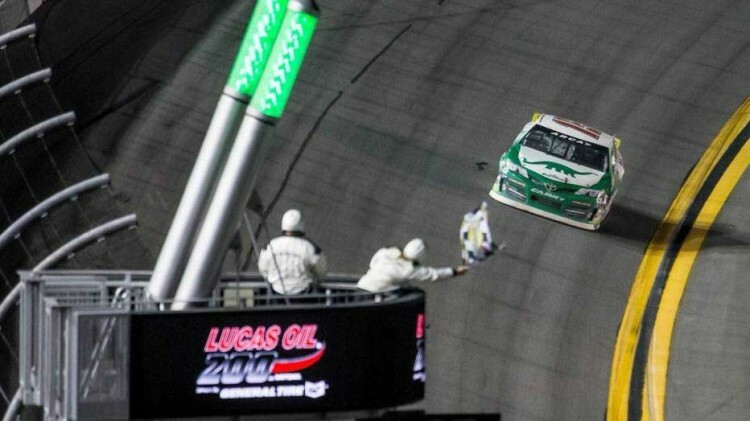 Previously, ARCA allowed unlimited attempts at a two-lap "green-white-checkered" finish if the white flag had not been displayed, and unlimited "green and white together" attempts if the white flag had been displayed and the caution flag was necessary prior to the checkered. In 2019, ARCA will move to one attempt at a one-lap "green and white together" finish at Daytona and Talladega. Overtime procedures at the other 18 races on the schedule remain unchanged from the previous unlimited attempts procedures. "We feel it's more fair to the teams and to the fans to finish the race closer to the advertised distance," said Grayling Call, Senior Director of Competition for ARCA. "Teams work on their fuel strategy throughout these races and when you have several overtime finish attempts it throws that strategy off for everyone. You could have cars running out of fuel on a restart that causes another crash." Team owners and drivers also welcome the change to the end of race procedures at Daytona and Talladega. "I think it's the right move to make," said Bret Holmes, who ended up on his side in one of the multi-car crashes that extended last year's Daytona race by 12 laps. "It will be a lot easier on the teams. We can all be patient all day long and then you tell us we have two laps to win at Daytona and that patience will go out the window. We destroyed a lot of good cars last year, hopefully this new procedure will limit that and help some of the teams like ours from wrecking cars we don't need to wreck." "I think it's great that ARCA is working with the owners to find a way to limit the costs, particularly at Daytona and Talladega," said Chad Bryant, owner of Chad Bryant Racing, who fields cars for Joe Graf, Jr. "There are very few people who know how much this really costs, and most wouldn't believe it. We work all winter on this one car and we know if a race goes into overtime there's a really good chance we're going to throw it away. "From an owner's perspective the change is a good thing," he continued. "From a fan's perspective, there's still an opportunity to finish the race under green if we go into overtime. I like to think there's a good balance there for everyone." The 2019 ARCA Racing Series presented by Menards season starts with the Lucas Oil 200 driven by General Tire at Daytona International Speedway on Saturday, February 9. Fox Sports 1 will broadcast the race live, with the green flag waving over the expected 40-car field at 4:45 pm ET. ARCARacing.com will have complete event coverage, including live timing & scoring and track updates, free for ARCA for Me members. New members can register at ARCARacing.com/login.